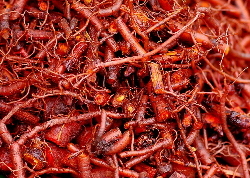 Madder roots produce a variety of reds including orange reds, brick red, blood red and fiery reds. The colour depends on the soil the roots where grown, their age, the mineral content of the water used for dyeing, the temperature of the dye pot, and how much madder you use in relation to the fibre. You can dye with madder either cold or with heat. Add chalk and avoid high temperature to get better reds. Several dyers recommend mordanting the wool just with alum, not using cream of tartar as well. I prefer to use wool that is mordanted in the usual way with both alum and cream of tartar but you might like to experiment. Soak the fibres overnight or for a few hours before adding them to the dye pot for both hot and cold dyeing. Which chalk should I use? Madder dye produces better colours in hard water. To achieve a good red you need to add chalk in the form of calcium carbonate. The chalk sold in outdoor shops for rock climbing (magnesium carbonate) is not the right type of chalk, neither is school board chalk (calcium sulphate) or agricultural lime (calcium hydroxide). Dissolve the chalk with a little hot water before adding it to the dye pot.